The origins and earliest branches of primate evolution are clearer and more ancient by 10 million years than previous studies estimated, according to a study featured on the cover of the Jan. 23 print edition of the Proceedings of the National Academy of Sciences. The paper by researchers at Yale, the University of Winnipeg, Stony Brook University, and led by University of Florida paleontologist Jonathan Bloch reconstructs the base of the primate family tree by comparing skeletal and fossil specimens representing more than 85 modern and extinct species. The team also discovered two 56-million-year-old fossils, including the most primitive primate skeleton ever described. In the two-part study, an extensive evaluation of skeletal structures provides evidence that plesiadapiforms, a group of archaic mammals once thought to be more closely related to flying lemurs, are the most primitive primates. The team analyzed 173 characteristics of modern primates, tree shrews, flying lemurs with plesiadapiform skeletons to determine their evolutionary relationships. High-resolution CT scanning made fine resolution of inaccessible structures inside the skulls possible. "This is the first study to bring it all together," said co-author Eric Sargis, associate professor of anthropology at Yale University and Assistant Curator of Vertebrate Zoology at Yale's Peabody Museum of Natural History. "The extensive dataset, the number and type of characteristics we were able to compare, and the availability of full skeletons, let us test far more than any previous study." At least five major features characterize modern primates: relatively large brains, enhanced vision and eyes that face forward, a specialized ability to leap, nails instead of claws on at least the first toes, and specialized grasping hands and feet. Plesiadapiforms have some but not all of these traits. The article argues that these early primates may have acquired the traits over 10 million years in incremental changes to exploit their environment. While the study did not include a molecular evaluation of the samples, according to Sargis, these results are consistent with molecular studies on related living groups. Compatibility with the independent molecular data increases the researchers' confidence in their own results. Bloch discovered the new plesiadapiform species, Ignacius clarkforkensis and Dryomomys szalayi, just outside Yellowstone National Park in the Bighorn Basin with co-author Doug Boyer, a graduate student in anatomical sciences at Stony Brook. Previously, based only on skulls and isolated bones, scientists proposed that Ignacius was not an archaic primate, but instead a gliding mammal related to flying lemurs. 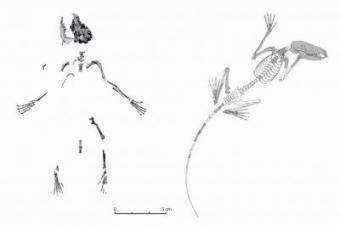 However, analysis of a more complete and well-preserved skeleton by Bloch and his team altered this idea. "These fossil finds from Wyoming show that our earliest primate ancestors were the size of a mouse, ate fruit and lived in the trees," said study leader Jonathan Bloch, a vertebrate paleontology curator at the Florida Museum of Natural History. "It is remarkable to think we are still discovering new fossil species in an area studied by paleontologists for over 100 years." Researchers previously hypothesized plesiadapiforms as the ancestors of modern primates, but the idea generated strong debate within the primatology community. This study places the origins of Plesiadapiforms in the Paleocene, about 65 (million) to 55 million years ago in the period between the extinction of the dinosaurs and the first appearance of a number of undisputed members of the modern orders of mammals. "Plesiadapiforms have long been one of the most controversial groups in mammalian phylogeny," said Michael J. Novacek, curator of paleontology at the American Museum of Natural History. "First, they are somewhere near primates and us. Second, historically they have offered tantalizing, but very often incomplete, fossil evidence. But the specimens in their study are beautifully and spectacularly preserved." "The results of this study suggest that plesiadapiforms are the critical taxa to study in understanding the earliest phases of human evolution. As such, they should be of very broad interest to biologists, paleontologists, and anthropologists," said co-author Mary Silcox, professor of anthropology at the University of Winnipeg. "This collaboration is the first to bring together evidence from all regions of the skeleton, and offers a well-supported perspective on the structure of the earliest part of the primate family tree," Bloch said.